It was a slushy day out there but I didn’t see anyone complaining. Just a bunch of smiling faces. 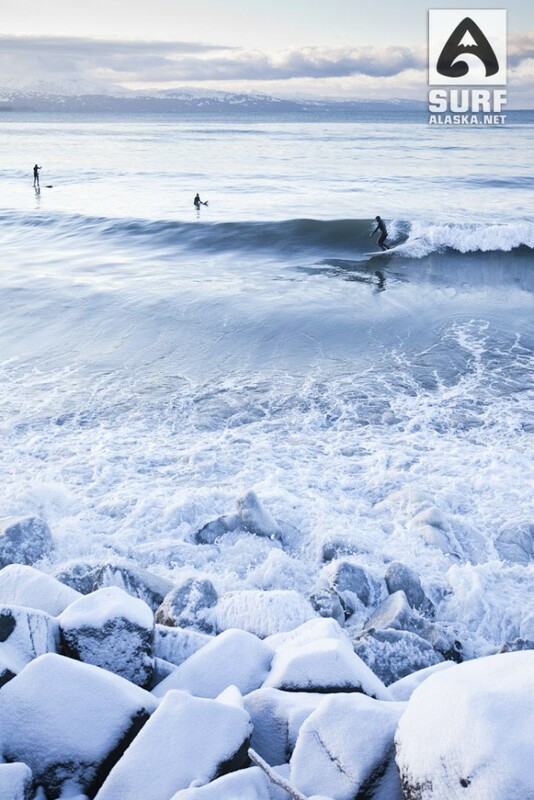 I was fortunate enough to maximize this swell and surfed all the way through a sunrise, sunset, and a moonrise. Seven hours in the water today and some incredible rides including some sweet barrels. Looks like Santa visited Homer early, I hope he’s heading your way next. That is, if he’s not going to stick around here. 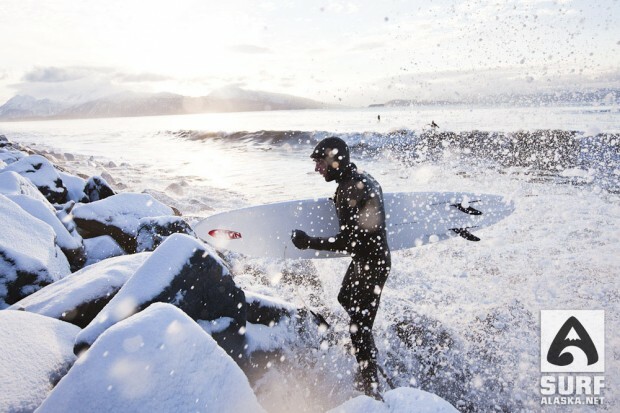 There are some funny things that come with surfing in the slush. 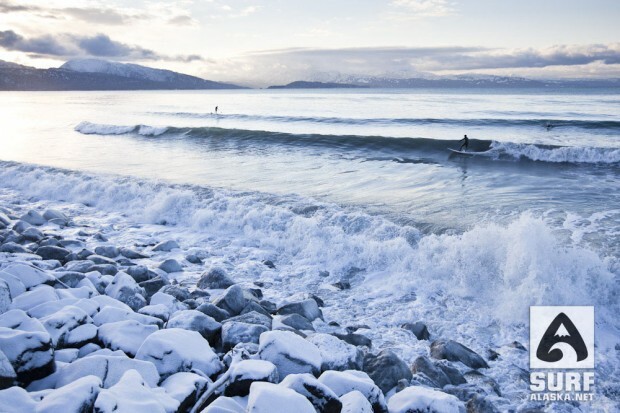 A strange whooshing sound under your board, the breeze doesn’t make ripples on the water’s surface, the waves resist feathering on the lips and just hold onto a glassy smooth shape until they just must break. 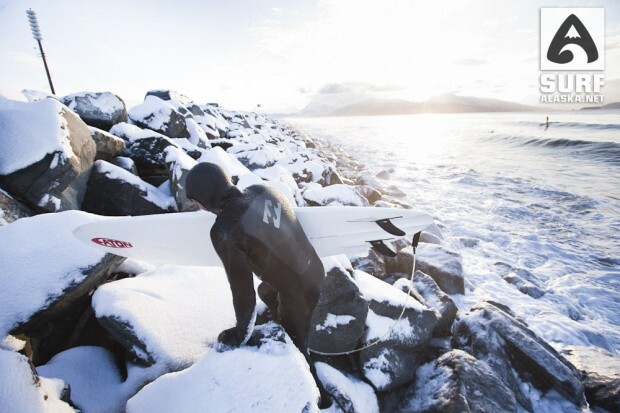 If you get a layer of the slush between your suit and your board you better hold on tight. Something else curious was happening today as the tide came in over the frozen and icy sand. If you tried to stand your ground against the little foam piles you just couldn’t. 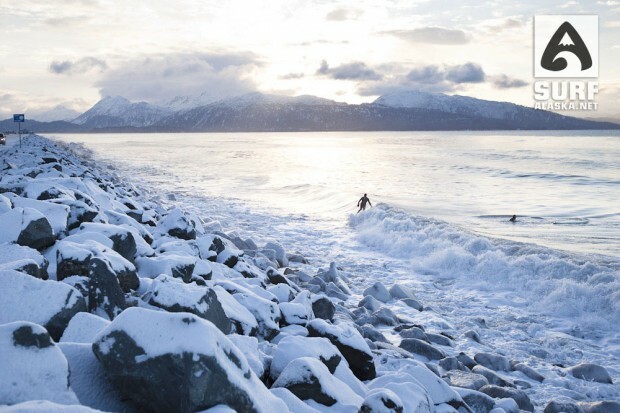 It took a few time before I just gave up with the walking back out to deeper water and jumping over the waves, I’d go to jump and just slip and fall. There has been days where there was total ice on the beach, with that situation you can barely even standup let alone walk anywhere. 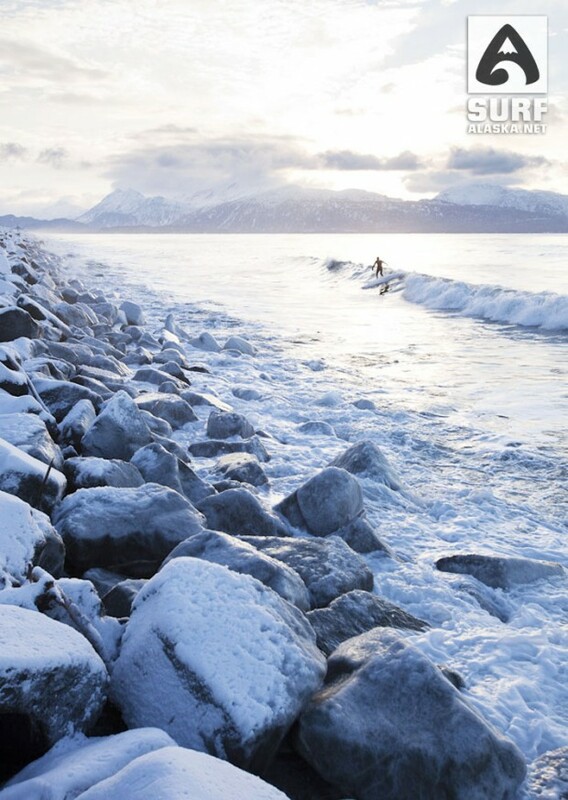 When it’s super icy like that even the smallest waves will just push you right back up into the slush piles on the beach. Camera got a little wet for this one. 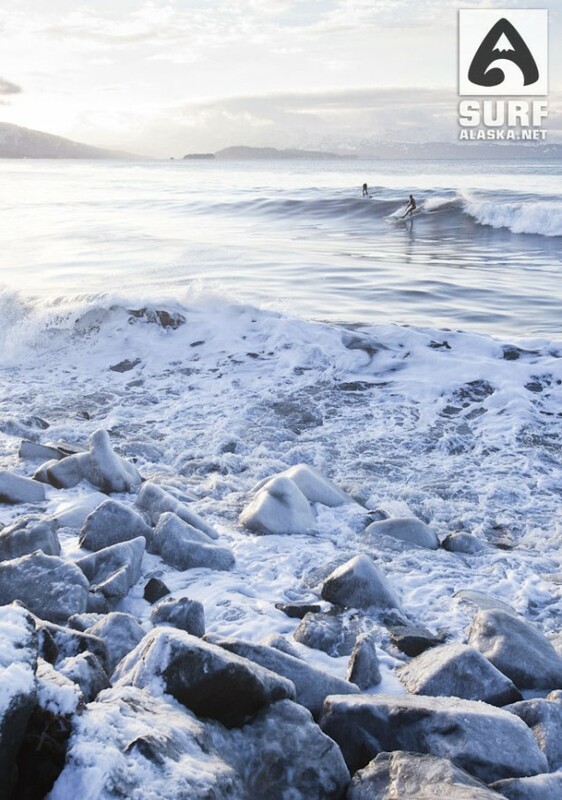 The surfboards get slippery enough at these temps, the ice covered rocks are something else. Mike McCune. Those swollen lips can still smile. 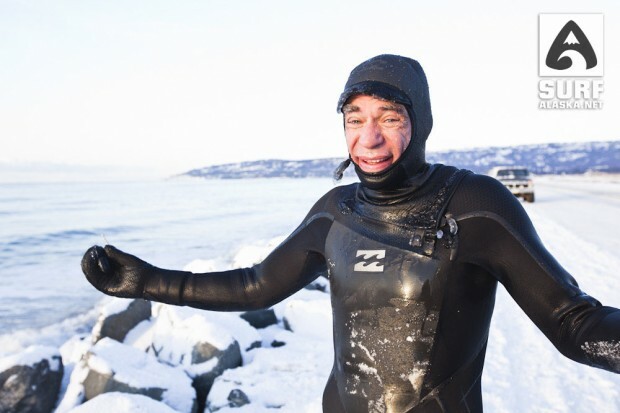 The water temps were probably around 35ºF. Clearly they were colder on the surface since the slush was forming. Winds were light and the sun was out for most of the day though we started and finished in twilight. 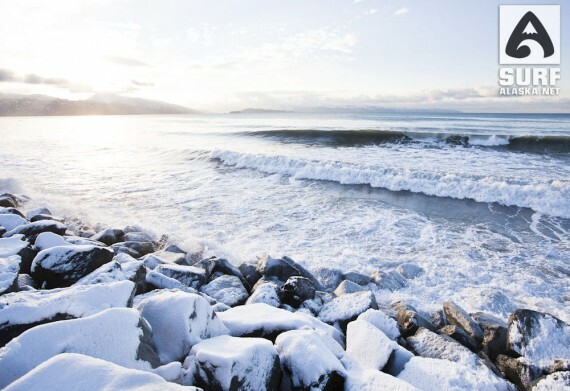 Mike and I were wearing the new Billabong SG5 6/5mm and stayed warm for a full 7hr session. This suit is surprisingly warm for how light and flexible and thin feeling it is. It has just minimal thermal lining on the chest and back. I had a few good flushings on some of the harder poundings but mostly I was very impressed with how little water came in, and when it did the suit drained quickly. Boots were Xcel 7mm Drylock and Quiksilver 7.5mm mittens. Altogether a very nice combo. From what I heard out in the lineup the guys with new suits were happy, the ones wearing their two year old suits were feeling the cold. Man the view and the sky look so incredible and I love how the sun travels around you instead of over you it really feels like the end of the earth I wish I could come to alaska especially in the winter I hear you have darkness all day long that’s great.